We could easily name ten or twelve retirement income strategies but several of them are really just variations on a theme. When you're trying to choose one, it may help to visualize them that way. 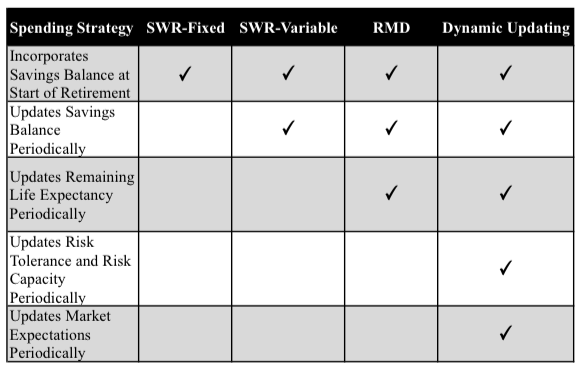 In a recent post, Dominated Strategies and Dynamic Spending, I showed that fixed-dollar sustainable withdrawal rates (SWR-Fixed), fixed-percentage rate SWR (SWR-Variable), and Required Minimum Distribution strategies are all dominated by a dynamic updating strategy. Game theory tells us that dominated strategies should never be played and that guideline should narrow the field of choices. In A Second Look at Time Segmentation, I argued that the benefits of time segmentation strategies may be largely behavioral. Holding large allocations of cash will reduce expected returns and Moshe Milevsky has shown (download Word doc) that the strategy cannot be counted on to bail us out of a bad sequence of returns, though it sometimes will. Nevertheless, many retirees appear to find comfort in time segmentation strategies, knowing that any spending problems are at least five years into the future. I'm always in favor of sacrificing a little economic efficiency if it helps the retiree sleep at night. I’m now going to argue that these are actually the same strategy applied to different degrees. A dynamic updating strategy, or dynamic spending strategy as I have sometimes referred to it, tells us to modify our spending periodically (typically annually), to reflect our ever-changing portfolio value, diminishing life expectancy, new expectations about market returns and risk, and any changes to our personal risk tolerance and risk capacity. If we calculate a sustainable spending amount once at the beginning of retirement, we have an SWR-Fixed strategy. This strategy's attraction lies in its simplicity of implementation and maintenance, but it condemns the retiree to spend based on conditions that might have existed two or three decades earlier. In other words, it ignores any new information after retirement begins – a foolhardy approach. Michael Kitces argues that no one really implements SWR-Fixed because retirees eventually realize they must spend less or can spend more and do so, and he has an excellent point. Wade Pfau argues that SWR-Fixed is a research technique and never was a retirement income strategy. I think he’s right, too. Yet, I don't completely buy the idea that no one tries to use the SWR-Fixed strategy by rote. For a decade or more, Money magazine touted the SWR-Fixed strategy, relenting only after many retirements were trashed in the 2008 market crash. I recently received a sample Kiplinger newsletter suggesting the strategy. With so much ink in the popular press for so long, it’s hard for me to accept that no one believes it. I hope Pfau and Kitces are correct, but I have a nagging suspicion that they are not entirely. If you’re implementing a SWR strategy by rote, please stop. In a post entitled, Sequence of Returns Risk and Payouts, I showed that an SWR-Variable strategy, in which a retiree spends a fixed percentage (like 4%) of remaining savings portfolio balance each year, eliminates the possibility of ruin inherent in an SWR-Fixed strategy. It provides variable annual spending but a more constant risk of failure than SWR-Fixed. SWR-Variable moves risk from longevity (running out of money) to payouts (perhaps needing to spend less), where it seems to do less harm. SWR-Variable reduces sequence of returns (SOR) risk by reducing spending when portfolio value declines. If we recalculate a sustainable spending amount annually, instead of once at the beginning of retirement like SWR-Fixed, and only update portfolio balance, we have an SWR-Variable strategy. Because it uses more new information, it dominates SWR-Fixed, but because it doesn’t update life expectancy, market return expectations and risk tolerance and capacity changes, it is dominated by dynamic updating. So, calculate spending once at the beginning of retirement and you have SWR-Fixed. Apply it annually, updating only your savings balance, and you have SWR-Variable. Basing spending on IRA Required Minimum Distributions (RMDs) also exposes us to less SOR risk than SWR-Fixed because spending will be reduced when portfolio values decline. RMD bases spending on an annual updating of portfolio balance and remaining life expectancy (updated annual spending is roughly current portfolio balance divided by remaining life expectancy), but ignores changes to expected market returns and changes to risk tolerance and capacity. As a result, it is also dominated by dynamic updating. Still, studies show that the RMD strategy is a reasonable approximation of dynamic updating strategies and a lot simpler. To quote David Blanchett, et. al. from a 2012 paper entitled, Optimal Withdrawal Strategy for Retirement Income Portfolios, "As a practical matter, for retirees who can’t replicate the results presented here or don’t have access to them, the RMD method emerges as a reasonable alternative to the more common constant dollar and constant percentage of assets withdrawal strategies." Dynamic updating strategies calculate a new sustainable spending rate each year incorporating all critical factors of the probability of ruin: current savings balance, remaining life expectancy, market return expectations and current risk tolerance and risk capacity. Spending is no longer tied to your personal financial situation as it existed at the beginning of retirement, or even the previous year. Lastly, let's look at time segmentation strategies. Time segmentation strategies hold four or five years of expenses in cash, the next five to seven years of expected spending in intermediate bonds, and the remainder in stocks to cover long term spending. The more critical parameters we consider in our retirement income strategy, the better the approximation of sustainable spending. The following table summarizes the variables considered by each strategy. Time segmentation is not included because it dictates an asset allocation but can use any of these spending strategies. How does this help a retiree? It should help by simplifying the broad array of retirement income strategies available. A retiree will always be better off updating her spending as her financial situation changes and the more critical information she updates in the process the better. SWR-Fixed, SWR-Variable and RMD strategies simplify sustainable spending calculations by ignoring critical new information. Time segmentation can be added to any of these strategies, but the financial justification for it is much weaker than the behavioral justification. What is the benefit of ignoring relevant new information? Only that it simplifies the math and reduces the management process a tiny bit – spending is recalculated just once a year in any case, except for SWR-Fixed, of course. Retirees unwilling to do that little bit of extra work will likely be better off with a set-and-forget strategy like TIPS bond ladders and life annuities. The sidebar shows a link to a recent post by Wade Pfau at Advisor Perspectives entitled, The Hidden Peril of Sequence of Returns Risk. SOR risk is complicated and nuanced. In several ways, it is unlike any other form of retirement financial risk, and certainly different than investment risk. No retirement income strategy is perfect, but the risks of SWR strategies are more difficult to understand than the rest. A great read. Brad, there is no requirement to make withdrawals before age 70 ½, so there is no such table. "RMD Strategy" is sometimes used to describe a generic spending plan with annual spending equal to 1/remaining life expectancy. For example, if your remaining life expectancy is 10 years, you could spend 1/10th of your portfolio balance that year. That doesn't require a table. The Uniform Life Table provided by the IRS is the one normally used unless you have a much younger spouse or are the beneficiary of an IRA. It doesn't precisely track life expectancy tables because it incorporates life expectancies for single and married. This will differ from Milevsky significantly in some cases because Milevsky also considers expected market returns and volatility and, thereby, evolving risk tolerance. For your purposes of comparison, I'd recommend you use 1/remaining life expectancy and ignore the legal minimum. The latter just tells you how much money you have to either spend or move to a taxable account each year to avoid a 10% penalty and taxes. As I mention in the post, RMD is just a lower-order approximation that is simpler to use, but if you're willing to do a little more work you can get a much better answer. Thanks, Dave. That will work, too. There are a couple of things to remember. First, RMD is a tax law, not a retirement income strategy. Some researchers simply noted that it's not a terrible approximation of more complex retirement income strategies. Second, you're better off using a dynamic updating strategy that accounts for more parameters than RMD. As I have, said, RMD is a dominated strategy. That is correct. Life annuities are able to take advantage of risk pooling and an individual cannot. Risk pooling means that some of the premiums paid by individual insurance purchasers who live less than the average life expectancy can be used as payouts to annuity purchasers who live longer than average. Insurance companies can predict quite accurately how many of the people they insure will live to every age, so they can calculate profitable payouts. (No one knows which insured persons will live to those ages, but the number who will is predictable.) The additional payout is called a mortality premium and that can only be created by risk pooling. Inherent in this process is an adverse selection bias because annuities are generally purchased by people who expect to live longer than average. This increases the cost of life annuities, or decreases the payouts, depending on how you want to look at it. Unhealthy people, for example, are less likely to purchase a life annuity. A program like Social Security works even better because there is a much larger risk pool and, because even young people are required to pay into it, there is no adverse selection problem. Dirk, I do have one more question please. If I use a life expectancy table to determine my withdrawal percent does this not mean that I may be overstating my withdrawal percent if I in fact my lifespan actually exceeds the average life expectancy? For example the average life expectancy for a 55 yo female from this life expectancy table is 83.65 yrs or 28.65 yrs. This would suggest a 3.49% withdrawal rate. If, however, this woman actually lived to age 90 (or 35 more years) her true withdrawal rate should have been 2.86%. Is there any rule of thumb about how much one should increase the average life expectancy table (remaining years) in order to provide a 95% chance of not outliving ones assets? Thanks, Brad. Yes, you would underestimate or overestimate your sustainable withdrawal amount if you didn't live precisely to your life expectancy with the RMD strategy. (RMD isn't the best approximation.) If you live less, you will have spent less than you could have. If you live longer, your life expectancy will constantly decrease each year and gradually compensate for the early overspending as you recalculate spending. Your spending needs will probably decline over that time, too, however. Is there any rule of thumb about how much one should increase the average life expectancy table (remaining years) in order to provide a 95% chance of not outliving ones assets? Yes! It's the Milevsky formula. If you want a better answer, you have to use a more complex formula than RMD and Milevsky provides that. I would also add to your comments about life expectancy Dirk ... you NEVER reach expected life expectancy of your CURRENT age because it always is older than you currently are. So trying to set an older-than-expected life expectancy age is understating what you could spend today. Dynamic Updating method also updates the life expectancy age each year - and it slowly grows older (not year for year) as you age ... thus, extending the number of years distributions are needed. Secondly, the RMD approach is a taxation methodology rather than a method for prudent spending in later ages. In other words, the tables force out more spending in the later ages than may be prudent when referencing life expectancy for those ages. Our paper in the JFP addresses how to adjust spending for this (http://www.onefpa.org/journal/Pages/Transition%20Through%20Old%20Age%20in%20a%20Dynamic%20Retirement%20Distribution%20Model.aspx ). Of course, the money must come out of the retirement plan - BUT, it doesn't need to all be spent. The excess between the two calculations should be set aside for future spending for older expected ages. A very nice summary overall Dirk - as usual! I think all roads lead to modeling all critical factors, and that can be done with Milevsky or simulation. The way points are SWR-Fixed, SWR-Variable, RMD, and the like, but those are simply lower-order approximations of the model. thanks Dirk, your articles are always very stimulating. Regarding Milevsky and sequence of returns. I agree that it shows that a strategy of not liquidating stocks in a major market downturn is not always optimal. However from his examples it was optimal most of the time ( and often significantly better) and when it was not optimal , it was only so by a small amount:. I wonder if many retirees can start off with a stock allocation of say 30% (Rick Ferri suggestion) or 35% (age in bonds) to minimize sequence of returns issues, but really would not be uncomfortable with stocks rising to 50% by using only fixed income if stock markets are down. . The only problem I can see with allowing stock allocation to rise is if someone started already pushing their risk tolerance to the maximum. I understand why for behavioral reasons it is probably better for most retirees to pick a stock allocation and stick with it ( or reduce it mechanically by eg 1% per year) but I suspect many could start retirement at lower than their maximum risk tolerance, then if stocks crash allow stocks to rise by fixed income withdrawal: at least rise to their pre determined risk tolerance. Is their anything wrong with having such an asset allocation "range" if risk tolerance allows? Milevsky is responding to the advice some retirement advisers give that holding a large cash position can avoid SOR risk. He isn’t claiming that it never works, or even that it doesn’t work most of the time (in fact, he states that it did in his tests). He is claiming that a large cash bucket cannot be depended upon to avoid SOR risk. Further, he shows that if the cash bucket doesn’t outlast the bad sequence, the retiree is left heavily in stocks and a continued market downturn could result in an extremely bad outcome. When you think about it, it’s the essence of sequence risk: it probably will work most of the time, but there is a relatively small chance of a disastrous outcome. So, you still have sequence risk. The Woerheide paper I referenced shows that the track record of the strategy isn’t impressive. I don’t believe you should "pick an asset allocation and stick with it." Glide paths are for mutual funds, not individuals. I think you should adjust it periodically to reflect your current personal risk tolerance and risk capacity and your market return expectations. You only “stick with it” if it still makes sense. There are two risks that should be considered when choosing an asset allocation: the risk that you will lose so much in a crash that you bail out of the market at the worst possible time, and longer-term sequence risk. Allocations between 40% to 70% equities can be justified to protect against sequence risk, but there is a significant difference in potential bear market losses between 40% equity and 70% equity. I assume the retiree you mention would have set a 30% equity allocation because he felt that was his maximum risk tolerance (if he was equally comfortable at 50%, why not just start there? ), so I’m not sure why he would still feel safe if his allocation crept up to 50% or more after spending cash and bonds. But, I think the equity allocation should be set to the maximum risk one can tolerate at the present time and still sleep at night, so if there was a retiree who felt that way, then no, I don’t see anything wrong with it. Thanks for the question, Derek! Would you be able to provide a link to the Milevsky formula and his explanation? Thanks. I wrote about this in Think Like a Bayesian Pig. You can find links there. Be forewarned that the math is formidable. If you look through the discussion section of that post, I believe I also posted a link to a spreadsheet that will do the calculations for you. Excellent post and discussion of dynamic updating strategies! So far, you have described dynamic updating strategies as being driven by factors such as savings balance, remaining life expectancy, market return expectations, and evolving risk tolerance/capacity. I respectfully suggest that dynamic strategies also need to reflect changing spending/cost patterns, many of which can't be predicted at the beginning of retirement. For instance, how many people really know how they're going to want to spend their money (above some basic planning floor) over the next 30-40 years? 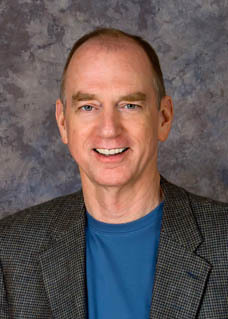 There are likely to be many evolving cost factors that can't be predicted; some of them may be embedded in Blanchett's so-called "spending smile," but costs and desired spending patterns can also evolve in quite unpredictable ways, especially if one is committed to ongoing personal growth and open to experiencing new things/interests (some of which may reduce annual expenditures). In the case of my own pre-retirement planning, I included a very generous amount of additional (and unspecified) discretionary spending to start when I retire. In the two years since I retired, I'm spending only about 30% of that addition out of choice; spending more would simply not add to my quality of life. Further down the road, I know that my constellation of hobbies, interests, friends, travel aspirations, etc. will shift somewhat -- probably several times -- and I'm prepared to dynamically adjust my annual budgets and financial projections accordingly. While I agree that your retirement plan, of which your spending strategy is one component, needs to address expense patterns, I think your issue may be the result of ambiguity around how we use the term "spending." And, that's an important clarification. When we talk about spending in the context of retirement income strategies, like dynamic updating, we are typically referring to the maximum amount a retiree can safely or "sustainably" spend from savings. This amount may be larger or smaller than the amount a retiree needs to spend on living expenses. That difference then falls under the budgeting portion of the retirement plan and spending takes on another context. So, while retirement spending strategies are functions of savings balance, remaining life expectancy, market return expectations, and evolving risk tolerance/capacity, etc., they are not a function of how much the retiree needs to spend. Yes, your expenses will change over time, unpredictably and perhaps significantly, and this is precisely why you need to recalculate the maximum safe spending amount periodically. But, the amount that you can spend will not be driven by the amount that you need to spend. Retirement spending strategies identify only the former. Hope that's clear, and thanks for contributing to the discussion! Thanks Dirk. I hate to look dumb, but is simulation the same as Dynamic Updating (#5 on your list on 3/17 blog), and if so I assume it is not as easy to update (might need to sit with financial advisor with ESPlanner for example) as simply updating some figures in Milevsky's formula right? Thanks, Brad. Actually, that's a great question. Dynamic updating and simulation are two different concepts. Essentially, dynamic updating means recalculating the safe spending amount from a variable portfolio periodically (typically annually), or alternatively, when important parameters change significantly. The best model updates several critical parameters including current portfolio balance, remaining life expectancy, market return expectations and risk tolerance. Regarding "simulation", there are three primary ways in which sustainable withdrawal rates are estimated. The first is looking at historic market returns. The second is using Monte Carlo simulation to create future market return scenarios. The third, Milevsky's approach, is to use "probabilities math" (stochastic calculus) to calculate "a sustainable withdrawal rate without simulation". Recalculating with Milevsky once a year is easy if you use the spreadsheet I provided (the math is complex). But I wouldn't recommend running simulations every year in any case. SWR rates are widely available from tons of research. Wade is now publishing them on his Dashboard, as I previously posted, though only for 30 year periods, I think. Regardless, the simulations have already been done, starting with Bengen back in the nineties. Different research will predict different SWRs and all of these will vary from Milevsky. Since they're all predictions, we can't know which will turn out to be right, so you might want to consider more than one before deciding. I'd say that's mostly right. Dynamic updating is recalculating spending periodically, but it should update all key parameters. Calculating SWR annually by just updating your portfolio balance and calculating 4%, for example, isn't really the dynamically updating strategy. Thanks Dirk. I attempted about 1/2 the ARVA article, and it was quite a slog. So would I be correct in assuming (from the list of income strategies in your 3/17 blog) that the TIPS bond ladder is your preferred income strategy because it is the least risky and has liquidity, but that if one wants to use risky assets then dynamic updating is your preferred method for determining one's safe withdrawal rate because it is the most accurate? Thanks, Brad. PS: Right now it appears from Wade Pfau's Dashboard that at 30 yr bond ladder with CPI-U adjustment provides a 3.65% rate while even the most aggressive portfolio (75% stocks and 20% chance of failure) only provides a 3.51% SWR. Brad, I don't have a preferred strategy, other than for myself. The best strategy depends on the retiree's unique financial situation. I have recommended TIPS ladders, TIPS funds, life annuities and floor-and-upside strategies to various clients, each with unique needs and desires. Each strategy has pros and cons. I can't say that dynamic updating provides "more accurate" results because all approaches try to predict the future and we can't know which one will do that best beforehand. I will say that it is a more accurate model of your retirement finances because it uses more recent data and more parameters than the rest. A really bad bet sometimes pays off, though, and a really bad strategy might stumble onto the best prediction. There are several strategies I don't like, either because they are flawed or because they are dominated by other strategies, as I have posted. If you want to use risky assets, which is fine – I do – then, yes, dynamic updating dominates other spending strategies. Be careful with your interpretation of Wade's Dashboard. The bond ladder will provide a 3.65% payout (not "rate of return", because the payout includes spending of your own capital) with no upside potential or downside risk. But the 3.51% SWR has both and 90-95% of the time you will do better. The catch is that 5% to 10% of the time you will outlive your savings. Time to Retire the Probability of Ruin?